We eat Primal in this house. I like to think of it as a relaxed version of paleo. We do dairy and white rice. I think she must read this book at least once a day, pouring over the different recipes. We've tried quite a few in the book and they've al been a hit. 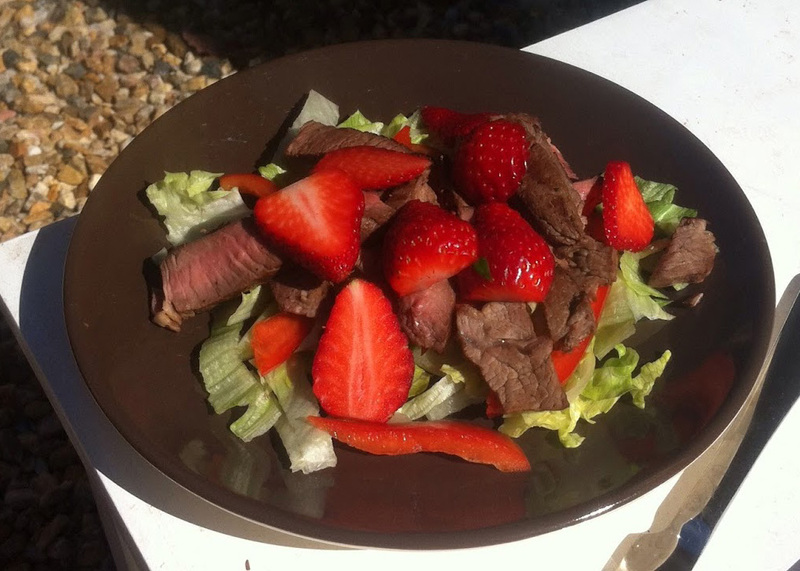 Yesterday we decided to make Steak and Strawberry Salad. We'd had steak for dinner so it was the perfect way to use up the leftovers. We sat outside and had a little picnic. It was beautiful and fresh on a warm winter's day. We didn't end up dressing the salad and I don't think it needed anything. The combination of meat and fruit was surprisingly delicious. Definitely one we will be making again! Can you make it next time I come over please ;) Looks delicious!